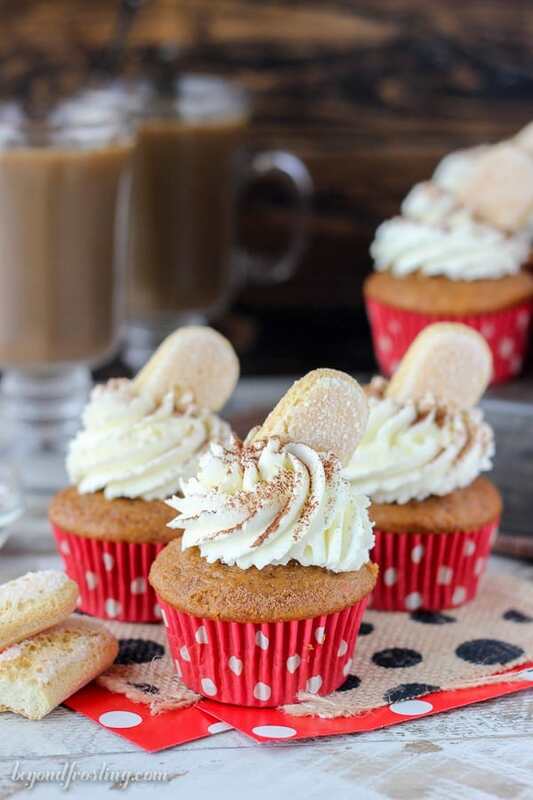 If you love pumpkin, then you have to try these Pumpkin Tiramisu Cupcakes. This spiced pumpkin cupcake is drizzled with espresso and bourbon and filled with a pumpkin mascarpone mousse. 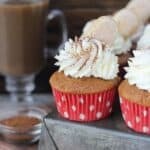 These are topped with a mascarpone whipped cream, cocoa powder and a ladyfinger. Since it’s nearly October, I figure it’s full steam ahead on my pumpkin infatuation, #sorrynotsorry! A few weeks ago, I called Lindsay and was talking about what I was making that weekend. 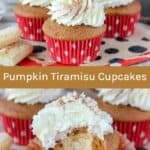 When I mentioned I had some Pumpkin Tiramisu Cupcakes, she said something along the lines of “shut up! 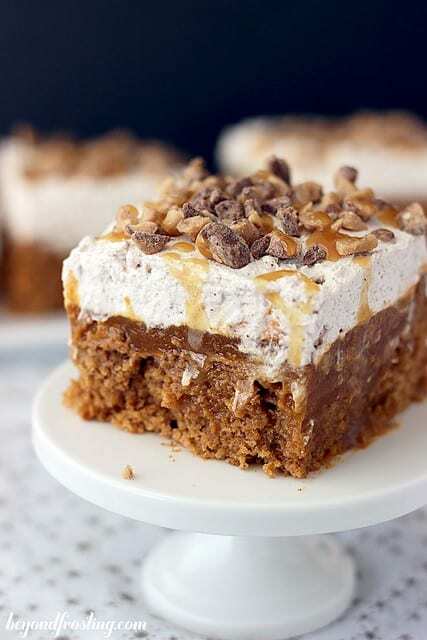 I just made a pumpkin tiramisu cake this week too”. I know she’s my “work wife” but sometimes our brains just think alike. She posted her cake last week and it looks seriously amazing! 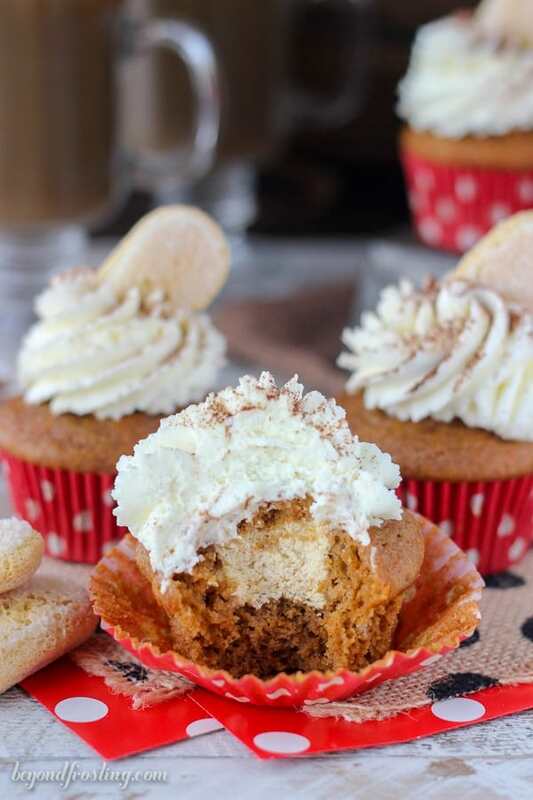 For these cupcakes, I made a pumpkin spice cupcake filled with a pumpkin mascarpone mousse and topped with a mascarpone whipped cream. Oh and did I mention theses some bourbon espresso soaked into the cupcake? Yeah, I did that. Bourbon and baking makes the world better. One the ingredients I called for in the cupcake is pumpkin spice pudding mix. I have been able to find this at Walmart during the holidays. If you can’t find this, substitute a vanilla pudding mix and then add an additional 1 teaspoon pumpkin pie spice. This is one of those cupcakes that doesn’t last long in my house. If I keep them around I will surely eat way too many of them. I can’t get enough of the filling, go ahead and just pass me a spoon. Seriously. 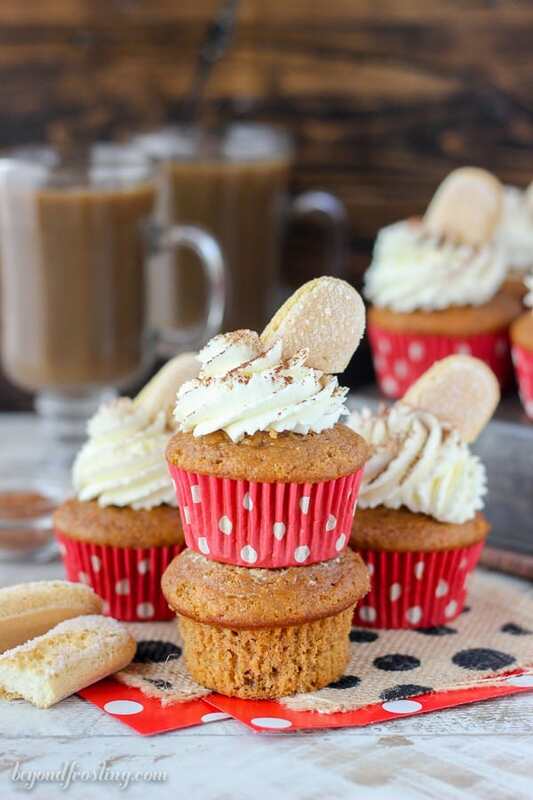 Pumpkin and mascarpone is a match made in heaven. Once the cupcakes are baked and cooled, hallow out the middle. I use my favorite cupcake corer, but you can also use a knife. Fill the middle of the cupcake with the pumpkin mousse and don’t be shy. I like to save the tops and stick it back into the filling to help protect the moisture inside the cupcake. It also gives you a nice smooth surface to pipe the frosting on. Then comes the frosting, a simple whipped mascarpone mousse with some cocoa powder on top. Mascarpone makes for the perfect whipped mousse because the flavor is delicate and it creates a nice stiff mousse, which pipes very nicely. Both the filling and the frosting have mascarpone, but you only need one container between the two. I recently found my WholeFoods carries a brand for $3 a container! So I encourage you to seek out options in your area if you like tiramisu as much as I do. These cupcakes might sound complicated but the hardest part is washing out your mixing bowl three times. You guys, the dishes are never ending for on a “working weekend” of baking a photographing. 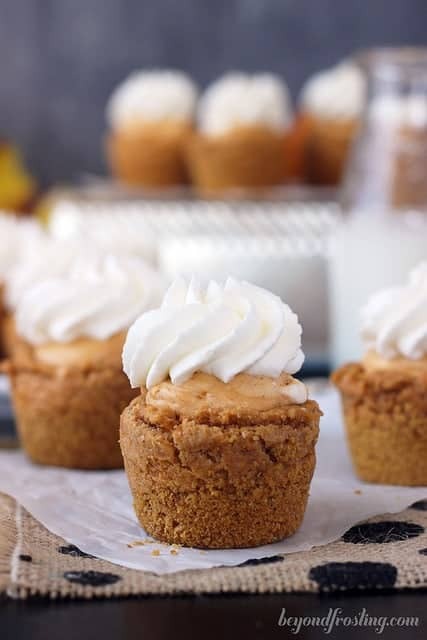 These are pumpkin spice cupcakes, drizzled with espresso and bourbon and filled with a pumpkin mascarpone mousse. 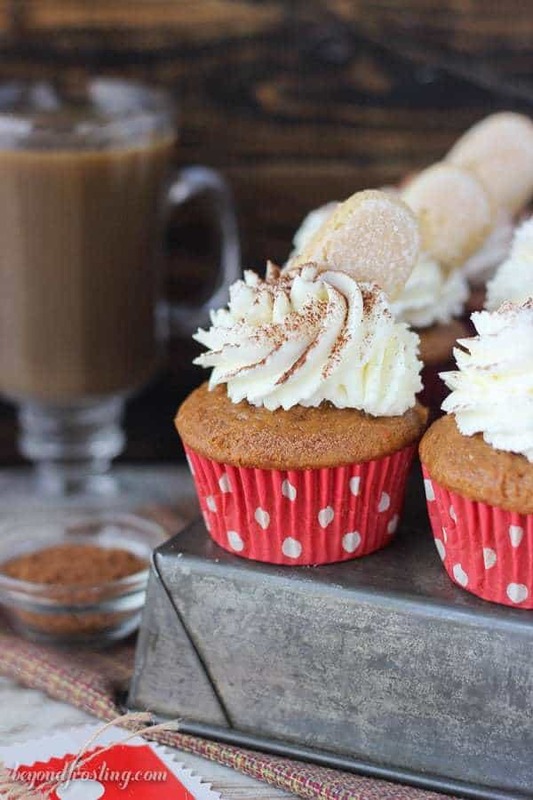 These are topped with a whipped mascarpone cream, cocoa powder and a ladyfinger. Prepare the cake first. Mix all dry ingredients (cake mix, pudding, cinnamon, pumpkin pie spice) in your mixing bowl and mix slightly to combine. Add eggs, oil, milk and sour cream and bourbon. Beat on medium speed until all ingredients are well combined. Fill the cupcakes liners about 2/3 of the way full, dividing the batter evenly. Hollow out the center of the cupcake using a cupcake corer or a knife, but do not cut all the way to the bottom of the cupcake. Set the “tops” aside and prepare your filling. For the filling: To prepare the espresso mixture, microwave the water until it’s bubbling, about 60 seconds. Add the espresso powder and stir until the powder is dissolved. Combine the espresso with the bourbon and set it aside. Drizzle 1 teaspoon of the espresso mixture into the hallowed out center of the cupcake. 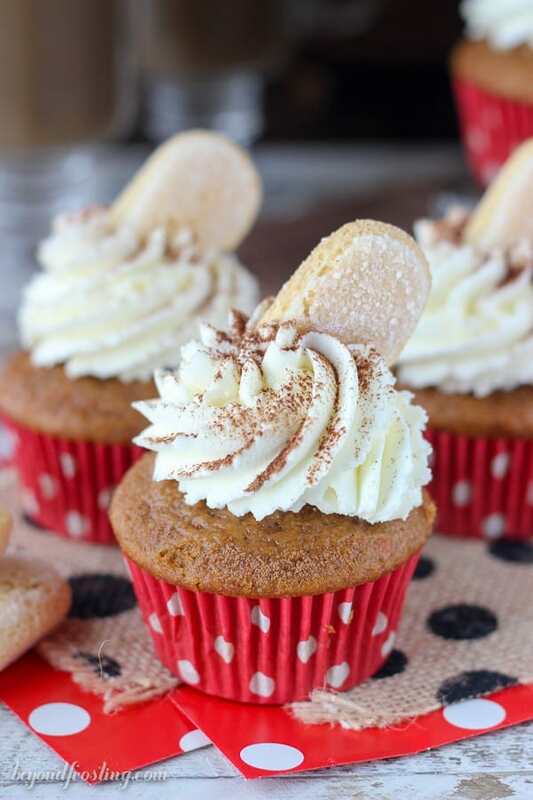 Fill the center of the cupcakes with the pumpkin mousse, don’t be shy! Then, can the tops of the cupcake that you cut out and stick them onto of the mousse to trap the moisture inside the cupcake. 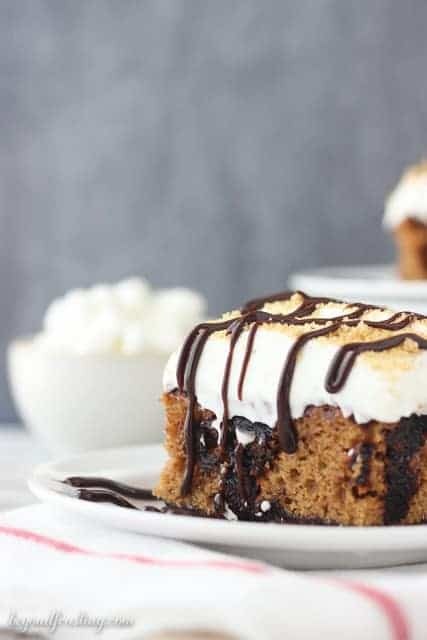 For the topping:Prepare the filling by whipping the mascarpone cheese for 30 seconds on medium speed and then slowly add the heavy whipping cream and scrape down the bowl until it is a liquid consistency. Increase mixing speed to medium-high and continuing to add heavy whipped cream. Once soft peaks start to form, add powdered sugar and increase speed to high until stiff peaks form. Fill a piping bag with your favorite tip and pipe the whipped mascarpone mousse on top. You will have enough for each cupcake, but don’t over do it. Dust the top of the mousse with cocoa powder and slice some Ladyfingers cookies to place on top right before serving. 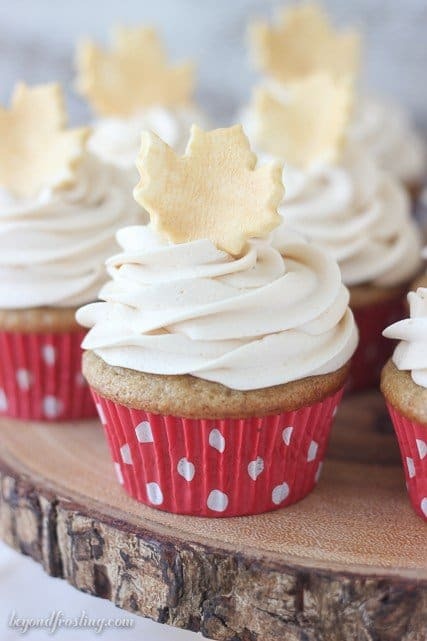 I’m drooling over these cupcakes! I love everything about them!